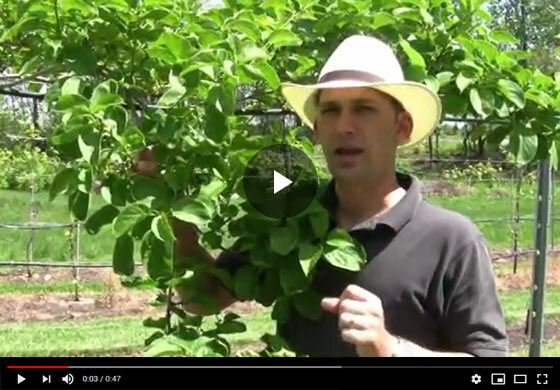 Felix from Gurney's Seed and Nursery shows off a hardy kiwi plant, providing insights into its growth habit and explains why it's important to protect your kiwi plants from early frosts. Hi, Felix with Gurney's and I wanted to talk to you folks today about kiwis and particularly hardy kiwis, and what to look for with their growth habit...where're you going to get your fruit and how to identify where your flowers are forming and why early frosts are a problem for some of these hardy northern kiwis. So here, if you look at this one that we have right here, this is one of our arguta species and you can see the woody growth of last year and there's some buds here, one of them broke and that shoot extension is where you have your flower clusters. You can see the little buds, flower buds that are going to be opening here in about a week and they're coming off of this current season's growth and the reason frost is detrimental to these kiwis is that when they break early and frost burns back that initial shoot, it basically takes out what will be your flowers, even though it will continue to grow and reinitiate new shoot growth from there, you won't get your flowers. So early frost protection, covering your kiwi leave when they leaf out in the early spring, is very important for getting fruit crops here. So key point in having success in your fruit...plus you also need a pollinator with these, look for our other video where I described when these flowers open what to look for to know whether you have a male and a female. Thanks for joining us.